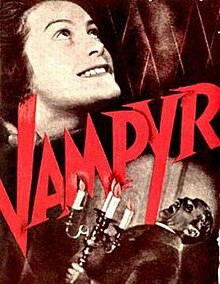 Vampyr (German: Vampyr â€“ Der Traum des Allan Gray, lit.Â 'Vampyr: The Dream of Allan Gray') is a 1932 Germanâ€“French horror film directed by Danish director Carl Theodor Dreyer. The film was written by Dreyer and Christen Jul based on elements from J. Sheridan Le Fanu's collection of supernatural stories In a Glass Darkly. Vampyr was funded by Nicolas de Gunzburg who starred in the film under the name of Julian West among a mostly non-professional cast. Gunzburg plays the role of Allan Gray, a student of the occult who enters the village of Courtempierre, which is under the curse of a vampire.Vampyr was challenging for Dreyer to make as it was his first sound film and had to be recorded in three languages. To overcome this, very little dialogue was used in the film and much of the story is told with silent film-styled title cards. The film was shot entirely on location and to enhance the atmospheric content, Dreyer opted for a washed out, soft focus photographic technique. The audio editing was done in Berlin where the character's voices, sound effects, and score were added to the film.